View a PDF of the press release here. Low income black and Asian women are paying the highest price for austerity according to new analysis by the Women’s Budget Group in partnership with the race equality think tank Runnymede Trust. The new analysis shows the impact of tax, benefit and public service changes at the intersection of income, gender and ethnicity for the first time. It covers fiscal policy from 2010 up to and including the 2016 Autumn Financial Statement projected up to 2020. Individuals in the poorest households lose most from tax and benefit changes, but in every income group BME women will lose the greatest proportion of their individual income. Low income black and Asian women will lose around twice as much money as low income white men as a result of tax and benefit changes. 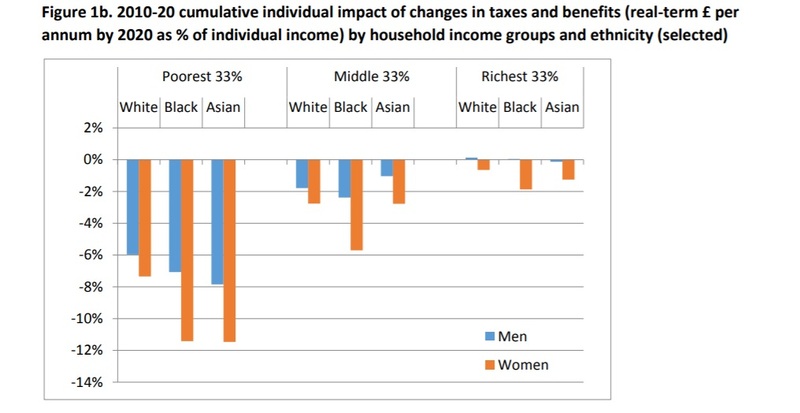 The chart below breaks down the different impacts of tax and benefit changes on black, Asian and white men and women by their place in the income distribution. Out of all household types, lone mothers are hardest hit by cuts to services and tax and benefits changes followed by lone fathers and single female pensioners (see Figure 2). “We’ve known for some time that the poorest households and women have shouldered the greatest burden of austerity measures. This research shows the compounding effect of income, gender and ethnicity. Women lose more than men, and black and Asian households lose more than white households. Taken together this sees the poorest Black and Asian women triply disadvantaged. “If the government is serious about building an economy and country that works for everyone, they need to take urgent action to redress this triple disadvantage. The measures announced in the Autumn Statement are insignificant when set against the backdrop of benefit and public spending cuts that these groups have borne. For lone parents, the new measures equate to only 2% of the total cash cut and for single female pensioners the figure is 1%. “The Chancellor has been clear that he wants an economy that works for everyone, yet this new analysis shows that his Autumn Statement does not begin to redress the disadvantages women in general and ethnic minority women in particular have faced as a result of austerity policies. Key to reading Figure 1b: By 2020, the cumulative effect of tax and benefit changes since 2010 on Asian women living in the poorest 33% of households will mean that their average individual income will be reduced by 11.5% per annum as a proportion of what it would otherwise have been had the March 2010 system been carried through to 2020.